Meghan Markle and Prince Harry have announced they are expecting their first child. Kensington Palace confirmed they will welcome their first baby, who will be seventh in line to the throne, in Spring next year. The Palace wrote online: “Their Royal Highnesses The Duke and Duchess of Sussex are very pleased to announce that The Duchess of Sussex is expecting a baby in the Spring of 2019. To get us even more excited for the baby’s arrival, we’ve just found out Prince Harry’s nickname for their baby and it’s the cutest thing. During a speech in New Zealand, Prince Harry said: “From myself and my wife and our little bump, we are so grateful to be here. We bring blessings from my grandmother, the Queen, and our family.” All the feels. This could be a difficult one with Meghan’s family being US-based, but generally, royals aren’t allowed to travel overseas whilst pregnant, which maybe explains why the couple waited until they’d touched down in Australia for their tour to announce the news. Whilst it’s common practice these days to throw a baby shower with your best gal pals, the soirée will be off limits for Meghan because of The Royal Family’s existing wealth. Royal expert, Victoria Arbiter, says: “the royals opt out of such events because they are ‘very wealthy… a lavish baby shower would be seen as highly inappropriate…There’s nothing they can’t go out and buy themselves.” Makes sense. The Royals don’t skimp when it comes to getting looked after, and for Kate’s pregnancies she had: two obstetricians, three midwives, three anesthesiologists, four surgical staff members, two special care staffers, four paediatricians, one lab technician for blood tests, three managers (and a partridge in a pear tree), with it being expected Meghan will receive similar VIP treatment. This super-strict royal protocol means the Queen must be told about the birth of the baby before anyone else…so they want to hope she picks up the phone. Whilst the world intends to spend the next nine months speculating what the baby’s name will be, we actually have a 1/4 chance of getting it right – as the new royal arrival will have up to four names. Harry himself has four names, Henry Charles Albert David, and all of Kate and William’s children each have three names. The couple are on their first official foreign tour together in Australia and were last seen at Princess Eugenie’s wedding last week, which is where they told the Royal Family the happy news. So what will the couple call the new arrival? The Duke and Duchess of Sussex have a lot more flexibility than William and Kate did, as their child probably won’t inherit the throne, and so they don’t necessarily have to use a royal name – and now experts are predicting what they’ll pick. 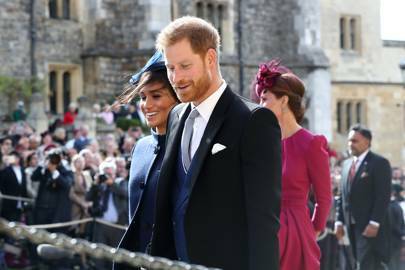 Pamela Redmond Satran, co-creator of baby name website Nameberry, has put Diana down as a top pick if the baby is a girl, as a tribute to Harry’s late mother. “Diana is of course Harry’s mother’s name and the people’s top choice for Meghan and Harry’s daughter,” explains Pamela. Other choices for a girl include Eleanor, as it’s already an iconic name in royal circles and American feminism, or Sophia – a name that perfectly bridges British and American culture. If it’s a boy, Pamela thinks Meghan will lean towards Alvin, after her grandfather, Alvin Ragland. “Alvin was an antique dealer who left his house in Los Angeles to Meghan’s mom Doria,” explains Pamela. Everybody thought that Kate and William’s son, Prince Louis, was going to be called Arthur, so there’s also the possibility that the royal name will take the top spot for Meghan and Harry. James was also on the cards for Kate and Will’s kids, but Pamela explains that Meghan and Harry would be more likely to pick it.